Brief Description: So you’re a fan of motor racing, but just how wide is your knowledge and how far back does it go? 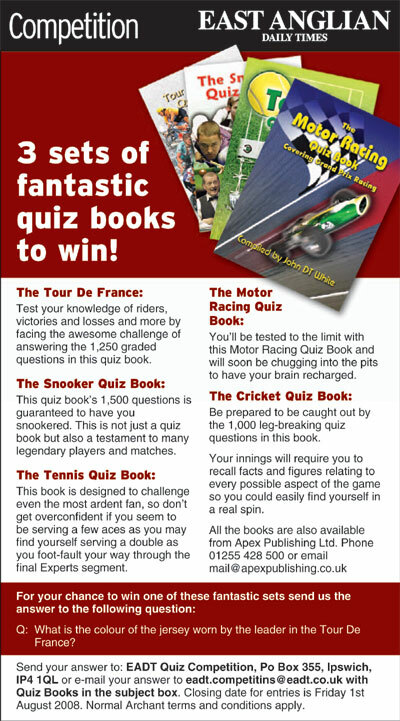 You’ll be tested to the limit with this Motor Racing Quiz Book and will soon be chugging into the pits to have your brain recharged when you reach the latter section designed specifically for the experts among you. However, you can console yourself that the wealth of information contained in this book will leave you a much wiser person. From the early days of Juan Manuel Fangio and Jackie Stewart to more recent personalities such as David Coulthard and Michael Schumacher, every decade is covered in this book, with questions on every conceivable Grand Prix, as well as teams, circuits, car manufacturers, pole positions, nationalities, final placings, world champions, drivers’ numbers, sponsors, constructors’ victories, engines and much more. Who was nicknamed ‘Il Leone’? What does a black flag signify? Where is the Gilles Villeneuve circuit? Don’t know? Well, buy this book and find out everything you’ve ever wanted to know about motor racing, and at the same time celebrate the wonderful personalities and memorable events that have moulded the sport of motor racing. John DT White has produced many books and this one is arguably his best. Perhaps, in part, because of its subject. Most sports fans will indulge in Formula one at some point in the sporting year. And here you will find facts, figures, and genuine surprises from the history of F1. Detailed and easily dipped into time and again. Well done and buy with confidence, you won't be disappointed. Robert Auty, Author of "Trance Warriors: The Siege of Scarn"
Lots of great information and should keep a motor racing fan engrossed for quite some time. A terrific Christmas gift! This is one F1 of a book. 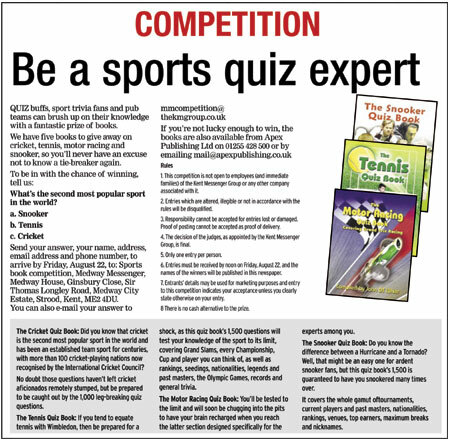 John DT White has excelled himself yet again with another superb collection of riveting quiz questions on the fastest sport on four wheels. John has pages on the 1980’s, Michael Schumacher, Mario Andretti, Mika Hakkinen and Graham Hill and some even harder ones on Lotus, Ferrari, Jordan, McLaren and Williams. 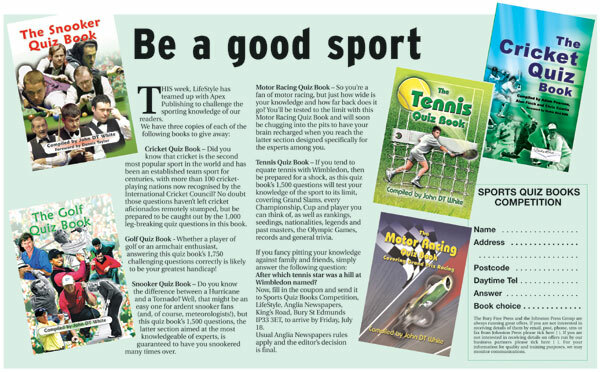 Clearly John enjoyed writing this book as he has been interested in sport in general for more than 30 years and in motor racing in particular since he bought his Ford Cortina in Starsky and Hutch colours. You remember the one with go faster stripes! 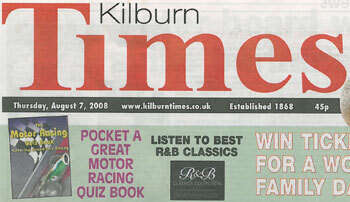 John, since 1974 has listened to almost every F1 race with commentary from the legendary Murray Walker, the voice of F1. 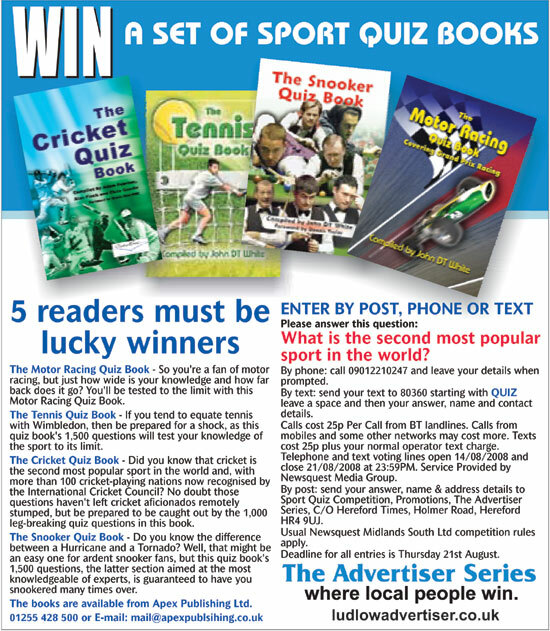 When a sports enthusiasts compiles a quiz book you know it is from the heart, with a knowledge of the sport and whether you are the secretary of your local motoring club or the quiz master in your local you will enjoy White’s comprehensive, thought provoking questions. More than 250 pages, more than 2,000 questions - this will keep any reader occupied for days rather than hours. 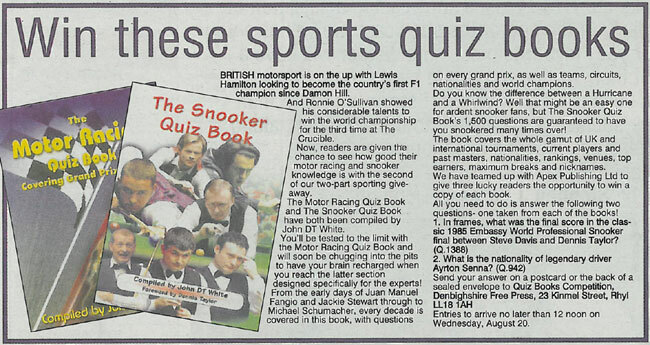 A great quiz book for any Formula 1 fan, this book is great fun! This book gets the old brain working for the older generation and is an education for the kids that are up and coming. It brings to life all the famous and not so famous drivers. I feel as a motor racing fan this book is to be treasured as is full of detailed information that I can pass down to my grandchildren when old enough to appreciate what I class as motor racing jewels of information, as they have heard me and seen me get truly excited over famous drivers. Good all round information and easy reading. If you are interested in motor racing then this is an excellent book to test your knowledge about the sport. It is full of interesting facts. 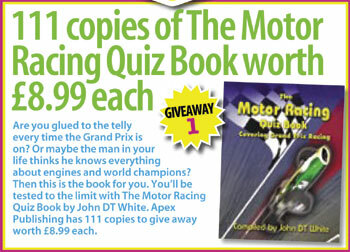 A very informative book, covering all the trivia needed for motor racing facts. A very good and interesting history book on Grand Prix racing. An excellent publication especially for my 7-year-old son. 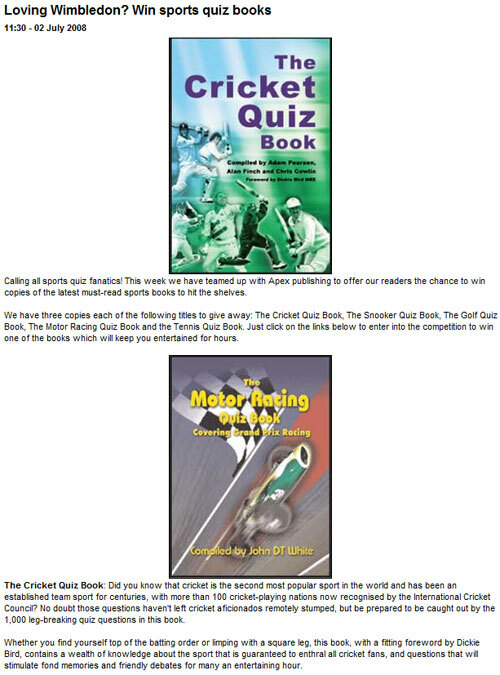 An exceptional book offering outstanding information along with the fun of gaining the knowledge. I found it very interesting and informative, extremely enjoyable. A book I will treasure always. Definitely one for the enthusiast! Also a mine of information for quiz buffs. 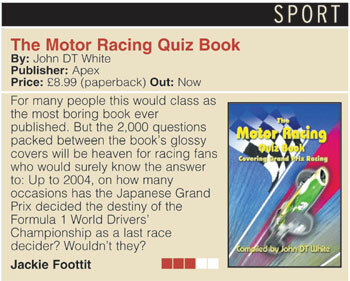 An ideal Christmas present for the motor racing enthusiast – giving hours of fun. It has been presented in an excellent manner and I liked the categories and the ease of finding the answers. It covered just about everything in the F1 world. 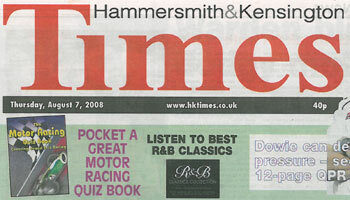 There is something for every F1 fan and will definately increase their knowledge. The quality of the book is great and the price is affordable. All in all well worth the money. I thought the book was well printed. The print was lovely. The layout was superb. It reveals the authors love of cars and racing. I like the variety of questions especially the "Who am I". 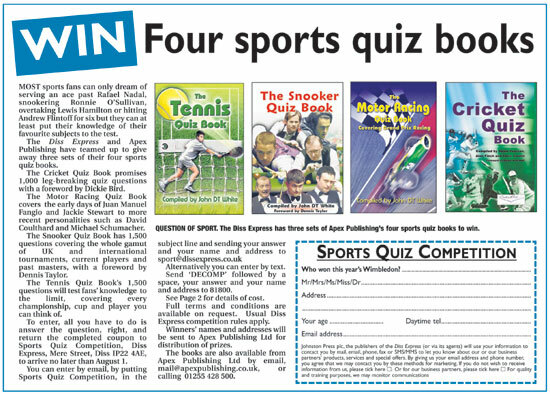 It would appeal to many motor racing fans and quiz fans. The book was excellent. 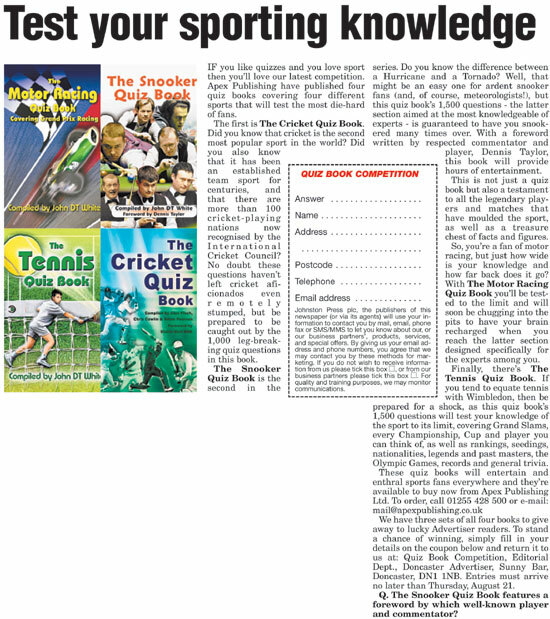 A lot of knowledge and good to use in pub quizzes. My son has pinched it off me! A very enjoyable book for all Formula 1 fans, as a Formula 1 fan myself it widened my knowledge. When having quiz nights down the pub a good quiz book helps. It helps you find out all you ever wanted to know about motor racing, the memorable events and personalities of everyone concerned with Formula 1. 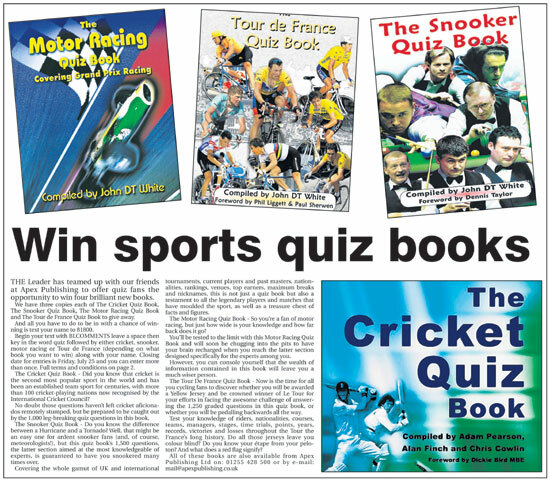 A first class quiz book on motor racing.